NOTE: This content is old - Published: Thursday, Apr 12th, 2018. 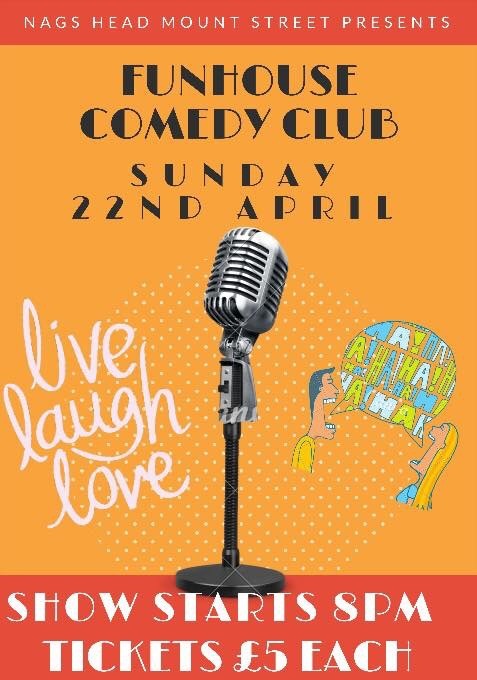 TOP COMEDIANS, GREAT ATMOSPHERE AND DELICIOUS FOOD..
Hi Folks, we are back at The Nags Head on Sun Apr 22nd for a great night of fun and laughter. Tickets are £5 in advance. You can reserve yours by replying to this email and they will be saved for you to pay on the door. Headlining will be Simon Wozniak with his inimitable and no holds barred opinions on everyday life. Also appearing will be Eddie Fortune discussing the woes of dating, work life and the need to stay in shape, the unique and bizarrely talented Roger Swift, with his laugh a minute gags and the quick-witted and engaging Jon Capewell. Completing the line-up is Mike Keenan with his amusing observations, the sharp and laid back Max Poole relating his hilarious tales and ‘Funny Women Awards 2012 Finalist’ Liverpudlian, Katie Tracey. Compere for the night will be Fran Jenking with his likeable charm and friendly banter.